Wespe from Romania makes this resin rendition of the ubiquitous Kübelwagen. The kit is packaged in a small cardboard box with the illustration glued to it. The one-page, one-sided instruction sheet is shown on the right. It is hand-drawn, and not always evenly copied. As this is a simple vehicle, most parts naturally go to their correct place. 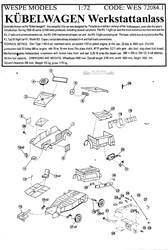 Unfortunately the part of the manual that is least clear is where the workshop-specific parts are installed. Fortunately the image on the boxtop can help. 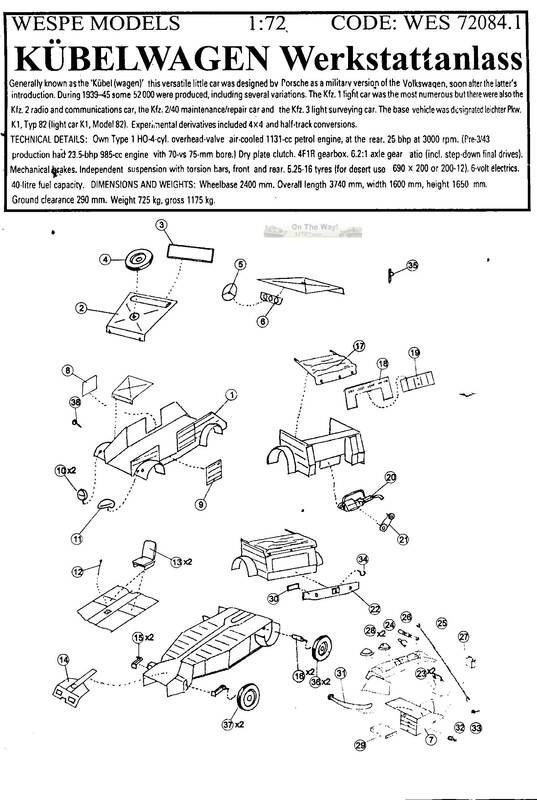 Here is the layout of the parts for this kit. 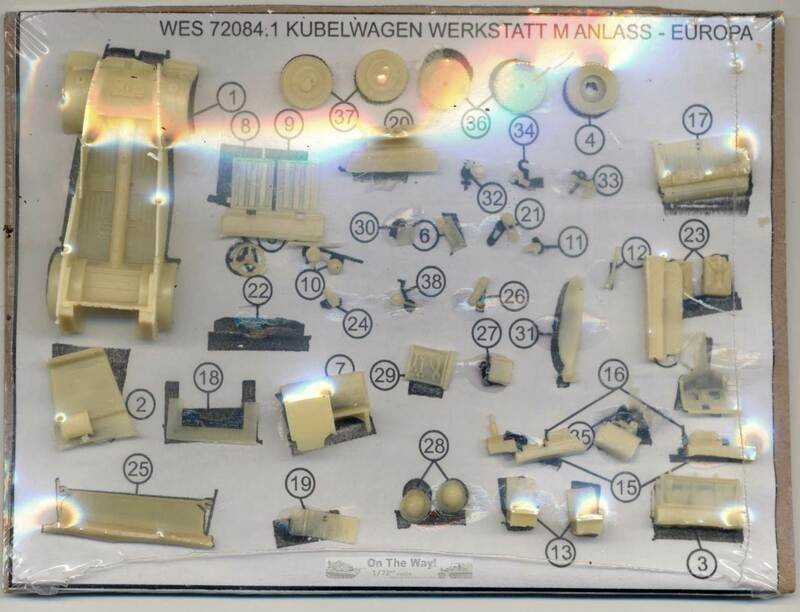 The way the kit is packed is original: all resin parts are individual pieces (i.e. not attached to molding carrots) and glued to a paper backing with a silhouette of the part. This makes it easy to check whether all parts are there. At first I thought some parts were missing, but they had simply detached from the backing and were found in the corner of the sheet. The plastic wrapping ensures that pieces are not easily lost. A big advantage of this method (and I have no idea how Wespe does it) is that there is next to no clean-up of molding carrots to be done. While this necessary evil is mostly a wild bore in most kits, here it is limited to an occasional film that protects fragile parts (e.g. the open area in the sidewalls where the doors will come). A minor disadvantage is the need to carefully remove the glue that is used to secure the parts to the backing. The kit can only be built with the tarp folded. It is not clear what some parts represent, but I guess one of them (31) is a bent propeller. the engine ventilation cover attached to part 17. (The tropical version drew air from the inside to keep the dust out). This can easily be cut away. The tropical pith helmets, which, of course, can be left out. Sand tyres are not included, however. 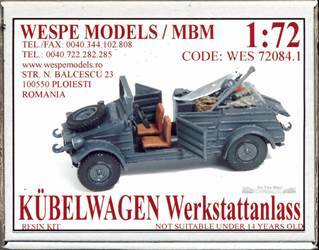 Wespe actually offers a DAK version of this kit, which includes the balloon tyres; I believe this is the only difference. 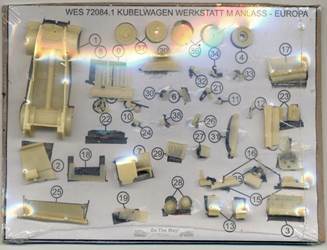 Wespe also offers a "Flugfeld" Werkstatanlass kit (72082), which I suspect only differs in the accessories. Wait a minute... my kit is the "regular" workshop kit, but includes a bent prop, which corresponds to the the airfield version. The boxtop also shows it.... I am confused now, I think I'll sit down. Note that the doors are of equal size, which is correct and something Academy got wrong. You get a part that looks to me to be a rearview mirror, but the instructions have you install it on the opposite (i.e. the right) side of the driver. Strange. You also get a tow hook, which I have not seen on a Kübel, but absence of proof is no proof of absence, of course. I didn't install it. The licence plate plaque that is provided is not rectangular. Mine was replaced with an item from Extratech. Apart from that, I didn't manage to figure out how to install the carter cover (part 14). The parts are very fine (the walls of the hull are much thinner than the available plastic kits) and with nice and abundant detail. Unfortunately warping and pinholes are present, while the ribs on one of the doors doesn't line up with the rest. While this can be taken care of with a certain amount of TLC, what finally made me relegate the kit to the status of shelf queen, was the roughness of some of the parts, which became blatantly apparent after priming. Sanding is an option, but with the corrugated nature of the walls of the hull and around some of the finer details, I felt unworthy of the task at hand. Some time after having promoted the kit to shelf-queen status I was in need of a wrecked vehicle to fill a void in a diorama. Given the roughness of the kit, I felt that it would be a good basis for a burnt-out vehicle. A couple of bullet holes were added, a fender bent and the upholstery of the front seat replaced by springs made from copper rod. Wheels from an Academy Kübelwagen (which are too small) were sanded down to serve as burnt-out hubs. The Academy Kübelwagen either comes as part of the WWII Ground Vehicle Set #1 or with the FW190A-8 "Heinz Bär" kit. I built both and as far as I can tell, both sprues are the same. Today (2009) this is the only injection plastic kit of this vehicle that includes an engine block. The engine louvres are present but only vaguely. The reinforcement ribs are present on the floorboard, laterally on the bottom (correct) and longitudinally on the top (incorrect as such, but they might represent floormats that were sometimes seen). The wheels are underscale and the nose too fat. The front and rear doors have different sizes, which is not correct. I built two copies of the kit. I replaced the wheels with two different types of replacement wheels from MK72 which can be seen here and here. As these are bigger than the Academy wheels (and they should), they interfere a little with the mudguards. Slightly bending the axles will resolve the matter. It is rather difficult to get a snug fit between the side panels and the mudguards. It is important to get this right at the first try, as the ribs on the outside of the hull will get in the way of filling and sanding. Moreover, the inside of the fenders (i.e. inside the hull) interferes with the deck (which is not an engine deck, by the way). Some dry-fitting and removal of some plastic will take care of this. The exhausts were hollowed out. Small sink marks in the sides of the nose were filled in. You get a choice between a transparent and opaque engine access panel. The transparent panel is a unique solution to allow the engine to be seen after construction, even though it is not realistic. Displaying the panel in the open position might be the better choice. Note that the panel is a bit too big if you want to install it in the closed position. It is impossible (?) to fit the windscreen after the hull has been assembled (as per the instructions). If you manage to do it, however, you will be able to install it in the upright or folded position. You get two parts for the canvas: stowed and deployed. The stowed part is nice, the other bland. I enhanced the deployed bonnet of one of my vehicles by gluing a coat of paper tissue over it. I also scratchbuilt flexible inserts that cover the opening between the hood and the doors. Flexible transparent panes were made with Kristal Klear. The other vehicle had a stowed hood. The edges of the loops to hold it in placed were scribed deeper to have them stand out better. The pick axe on the right side of the nose was seldom seen on real vehicles; I only installed it on one of the kits. The shovel interferes with the headlights, which, I suspect are positioned too far to the rear. One of the kits was converted to a workshop vehicle using the Wespe kit as a template. The drawer was also "borrowed" from Wespe, as were some of the accessories. Other accessories came from the ubiquitous spares box. Part 18 is not mentioned in the instructions. A small taillight, convoy light and blackout taillight are missing at the rear. A horn and rear view mirror are missing. For this early version of the Kübelwagen, the rear licence plate should extend beyond the edge of the hull. One vehicle got decals from the "Heinz Bär" kit, the other from the spares box. Review samples bought by the author.